Dwyane Wade will hang up the No. 3 jersey after more than 2,300 points, 13 All-Star appearances, three NBA titles and 15 years in the NBA. 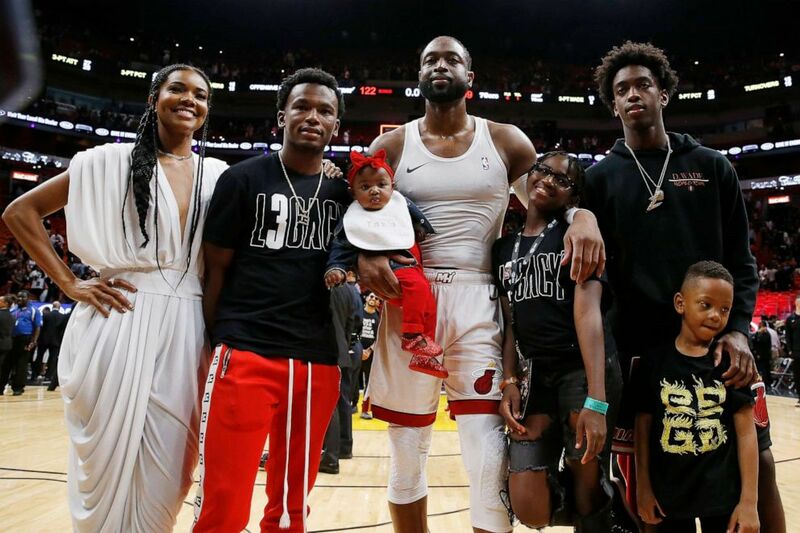 Dwyane Wade poses with his wife, Gabrielle Union, nephew, Dahveon Morris, and children, Kaavia James Union Wade, Zaire Wade, Xavier Wade and Zion Wade after his final career home game at American Airlines Arena, April 9, 2019, in Miami. 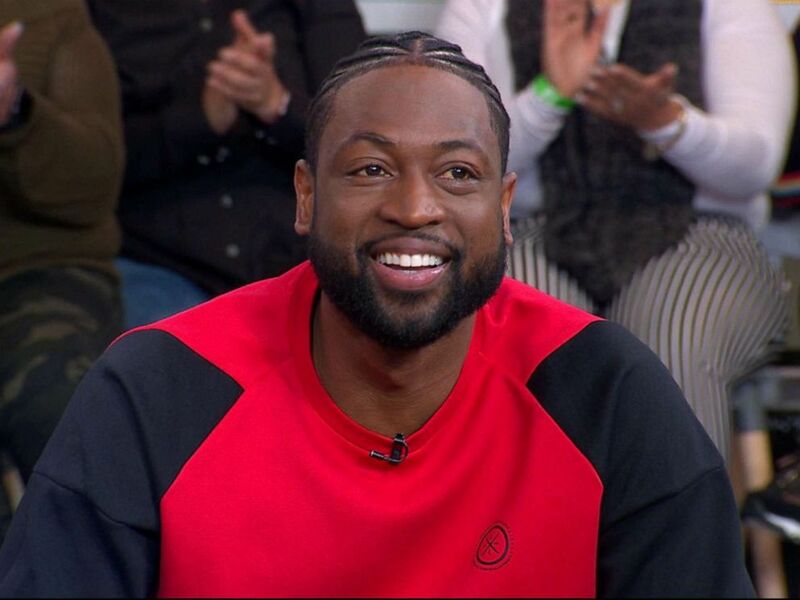 "I’m so lucky to be in the situation where I have a five-month-old daughter by my side -- it just was so fitting to have the opportunity to end my career with me carrying her," Wade said on "GMA" about his daughter Kaavia. He added he was "just filled with so much gratitude, I'm filled with so much love and so much appreciation for the people that supported me." "I just want to thank the fans, they made this last season like a movie for me," he said. In his final regular season game against the Brooklyn Nets at the Barclays Center, Wade's friends -- known as the "Banana Boat" crew -- sat courtside and witnessed his 25-point, 11-rebound and 10-assist performance, notching the fifth and final triple-double of his career. "Those guys all being there for my last game, being over there cheering the whole game, talking to me the whole game, man it was so dope, it was so cool and I was so appreciative of it," Wade said. Dwyane Wade appears on "Good Morning America," April 12, 2019. Wade also celebrated after the game with his wife, actress Gabrielle Union and singer Justin Timberlake. 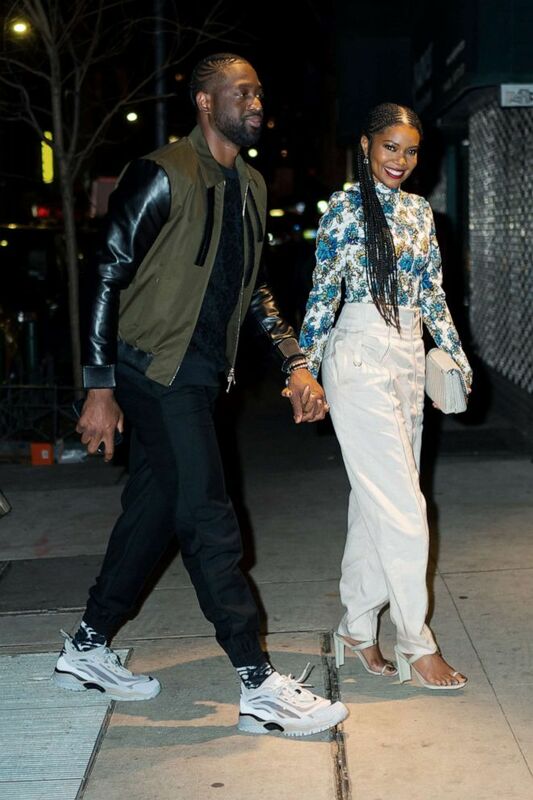 Dwyane Wade and Gabrielle Union out in New York City, March 29, 2019. "I had a hangover," he admitted with a smile. "It was rough; I admit it's the first hangover I've ever had in my life, and it sucked." "I got so many things going on already," Wade said. "I just signed a lifetime contract with Li-Ning brand, my shoe and apparel brand." He also said he is starting a side company called Parkway and "has a lot of partnerships and relationships that I want to make sure to continue to grow." Wade first announced his retirement last September in a video titled "One Last Dance," which became the name for his farewell 2018-19 season. 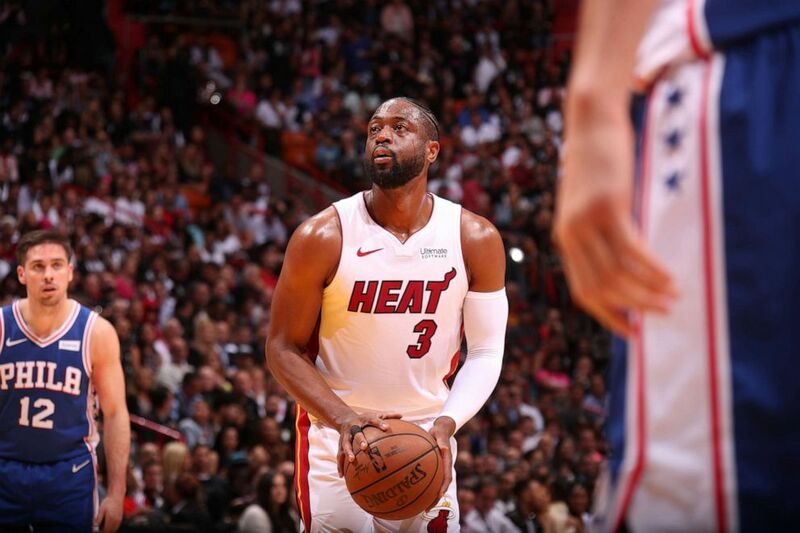 Dwyane Wade of the Miami Heat shoots a free throw during the game against the Philadelphia 76ers on April 9, 2019 at American Airlines Arena in Miami, Fla.
- Third best shooting guard behind Michael Jordan and Kobe Bryant. - Led the Heat to its only three franchise championship titles. - Selected fifth in the first round of the 2003 NBA draft out of Marquette University. - Scored 30 points in his final home game on Tuesday. "Walking off, I did the lap around the court with my wife, and I just wanted to thank the fans," Wade said on "GMA" of the game against the Nets that capped his career. After the victory over the Philadelphia 76ers Tuesday night, an emotional Wade took the time to thank each of his teammates this season, including those who had been cut or traded, by name. PHOTO:Dwyane Wade of the Miami Heat thanks the crowd after the game against the Philadelphia 76ers on April 9, 2019 at American Airlines Arena in Miami, Fla.
"I'm thankful for this moment. I'm thankful for this entire season," he said, standing next to his oldest son, Zaire. "I've got some brothers that will always be my brothers. I love you guys." A touching tribute video began with Erik Spoelstra, Wade's head coach of 10 years. 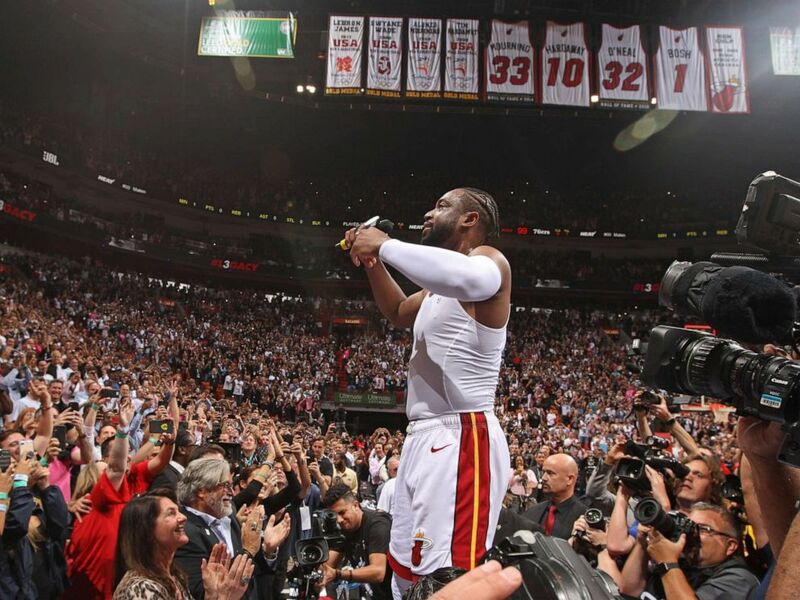 It transitioned to his former teammate Shaquille O'Neal, who narrated the first act of Wade's career -- including the first NBA championship they won together in 2006. Then, the tribute turned the page to the second act, which was narrated by his longtime teammate LeBron James and covered the "Big Three era" in Miami, when the Heat won two back-to-back titles and reached four NBA Finals in as many years. It also included Wade's departure to Chicago, where he played for the Bulls in the summer of 2015. The final act showed Wade's triumphant return to Miami last season and was narrated by three people: his wife, Union, his longtime teammate, Udonis Haslem, and Pat Riley, who coached and ran the Heat during Wade's entire career. The video ended with a silhouette of Zaire Wade, who was shown walking all alone into American Airlines Arena. He mimicked some of his father's moves -- from the pull-up midrange jumper to a pump fake -- then slowly walked up the steps of the arena bowl to a microphone, where he sat down and introduced his father. ESPN and FiveThirtyEight contributed to this report.